SKAK has received the Gold Award for the “Best Acoustic Kamp” since 2002. Designed to gather musicians of all levels from around the globe with common goals — learning, playing, eating and sleeping music. SKAK features top notch ukulele classes. Click here for a Kamp video. Whether you are a beginner's beginner or a seasoned professional, Kamp classes and activities will inspire and challenge you.​ Kamp intent is to maintain a non-competitive, learning atmosphere that will encourage you to grow musically and seek out new ways of playing your ukulele or a variety of other instruments. Click here for a complete Kamp brochure and to register. Ukulele workshops all day, daily ukulele jams and open mics, and an all-star concert each evening. Immersion ukulele classes taught by Gerald Ross and Tony Anthonisen. Gerald will help you take your intermediate—advanced ukulele playing to the next level. By the end of Tony’s classes, beginners will be able to comfortably play ukulele songs and join jams. Gerald Ross - Gerald is one of America’s best-known performers, entertainers and advocates for the ukulele. He’s released seven solo CDs, published instructional materials, and is very much in demand as a music festival instructor in the United States and abroad. Click here for more about Gerald. 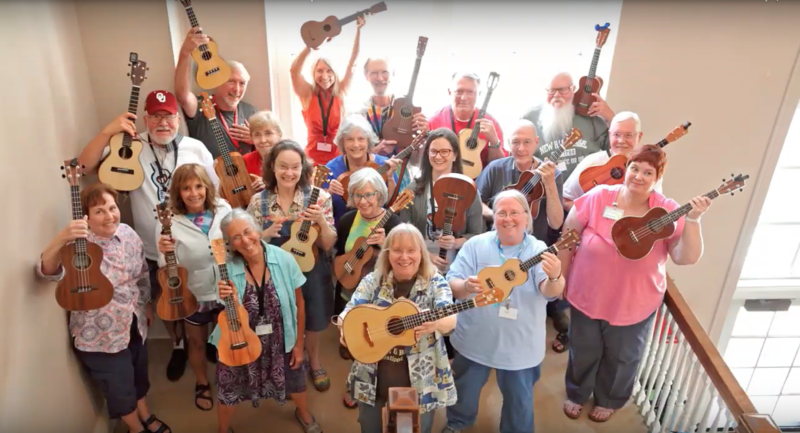 ​Tony Anthonisen - Tony’s classes and teaching style emphasize providing an environment for ukulele learners that is caring, encouraging, and 100% non-threatening. He firmly believes that “if learning and playing ukulele isn’t fun, why do it?” Click here for more about Tony. ​Who - SKAK ukulele players and singers - For all skill levels! - And we mean ALL skill levels, including beginners! What - An all level jam using the Daily Ukulele: 365 Songs For Better Living (the “Yellow Book”) as our song source - Led by Tony Anthonisen - Ukuleles, banjoleles, resonator ukes and kazoos welcome! The “Yellow Book” will be for sale at the Kamp Store. It can also be purchased in advance in a hardcopy or downloadable e-copy for iPad and other tablets here. When - 4:15 to 5 p.m. Monday through Friday. Registration - Registration is now open. Some classes have limited spaces.